Summer is supposed to be coming to an end, but the last week has been the hottest so far this summer... Not that hot compared to where lots of my friends live, but hot when you don't have air conditioning. But I can't complain, because the ocean is not very far away and the water there is always cool. 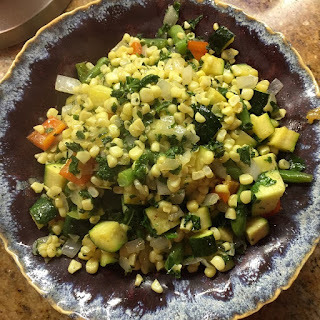 Succotash is supposed to have lima beans in it (and they certainly could be added to the below recipe), but this mix of vegetables that has been serving me (and my house guests) well all summer. And I'm still getting corn and zucchini farmers market. 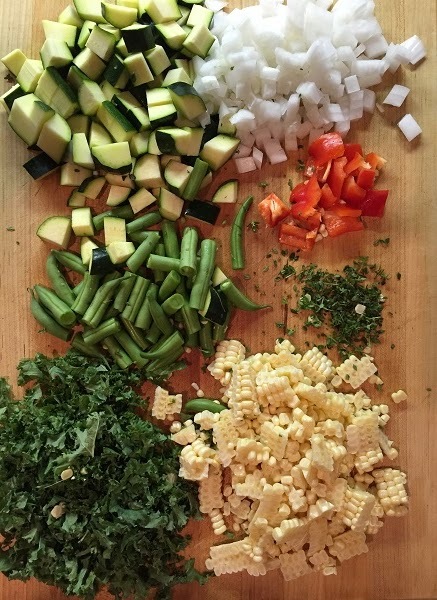 It seems that often I have a nice mix of vegetables around, but not enough of any one thing to make a nice vegetable side. So I just put them all together, and its the perfect accompaniment to whatever is coming off the grill. Don’t fret about the quantities, use whatever you have around. This will feed about 4, scale as desired. Melt butter (or heat oil) in a sauté pan. Add all of the vegetables (except greens if using) and cook over medium heat until just cooked, 7 – 10 minutes. Add greens (if using) the last minute of cooking. Add thyme, salt, and pepper.